My name is Dottie. I’m a proud, first generation American Bulldog. With nothing more than a bone and a dream, and a dream of a bone, my parents came to this new world from the land of Caninica. Caninica was once a proud land where dogs ruled the earth. Then came the cats and the Seven Hundred Year War. Darkness followed. And then came the Great Kibble Famine. More darkness followed. And then my parents had to leave. Their journey was long and hard. They got thirsty. And then they came to America. They came because they wanted a better life for me. I’m a lucky dog. Oh, yeah. Only in America can a dog’s dreams come true. I love music. My dream has always been to make music. 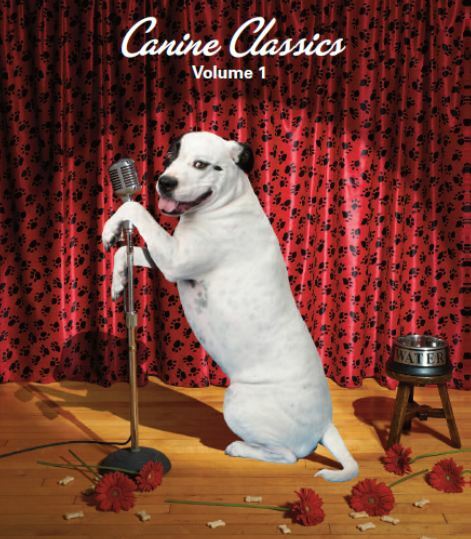 “Canine Classics, Volume 1” is a collection of my favorite songs along with pictures of my friends. I like it. I hope you like it, too. You guys should make a Wikipedia article to link to about Caninica….. I loved the pic of Village Pooches, especially the Leather cap and vest and of the spaniel Indian. Y’all should make a linkable version of “Turning Pekingese” for Halloween…. I’m sure friends would share it on Facebook and similar, which would help to promote the album. Not to mention, Arf Arf! Oh my goodness, I love these songs!!!! This is a MUST HAVE CD in my house!!! Zimba will love it!!! Thanks, Bing for sharing this on FB!!! Thank you! I like your Style!